I visited a farm several months ago and really liked their tractors. Not John Deeres, Kabota, or Farmalls. These were cages that held turkeys and were portable. The designs were great! So I took lots of pictures, brought them home and figured out what I would need to make something similar. Here’s what I came up with…. The kids and I and our intern started work about 8 am and had the majority of this made by noon. 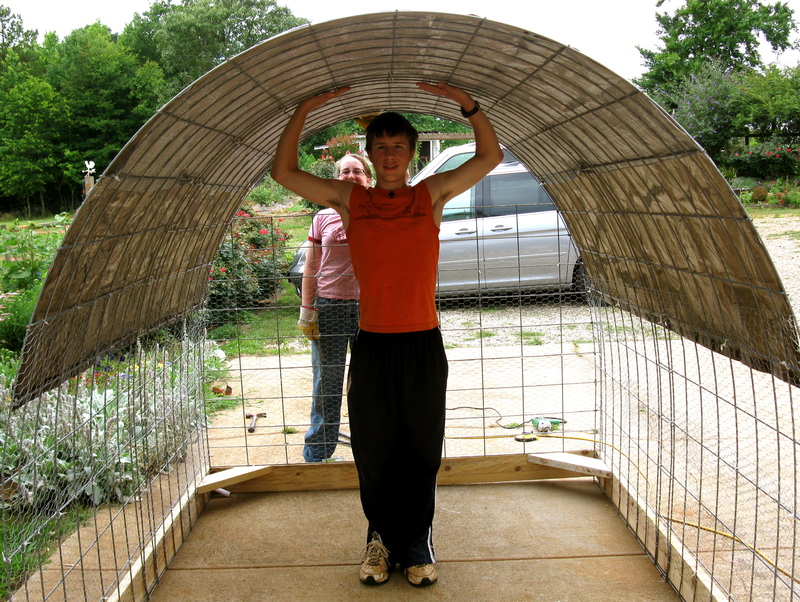 We made the frame out of 2 x 6 boards – 7′ feet long x 6’8″ wide. The cattle panels that make the dome are about 4′ tall and I wanted them to overlap by a foot. 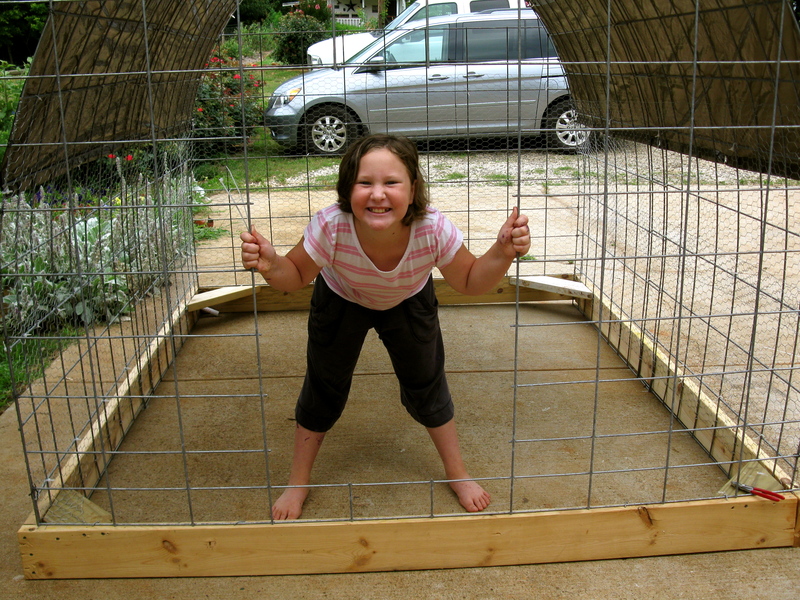 It took 3 of us to get the fencing inside the frame – one on either end and another in the middle to push it up. 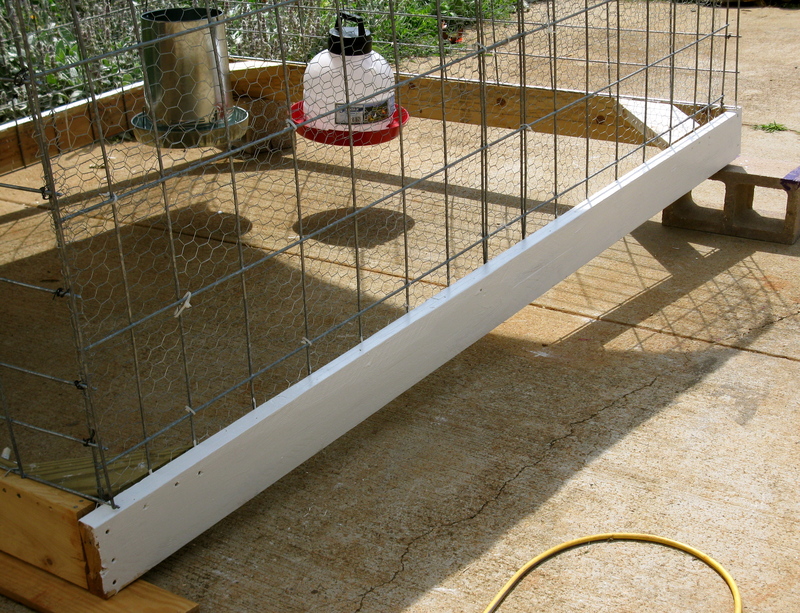 The fencing is 16′ long and a little tough to maneuver over your head. 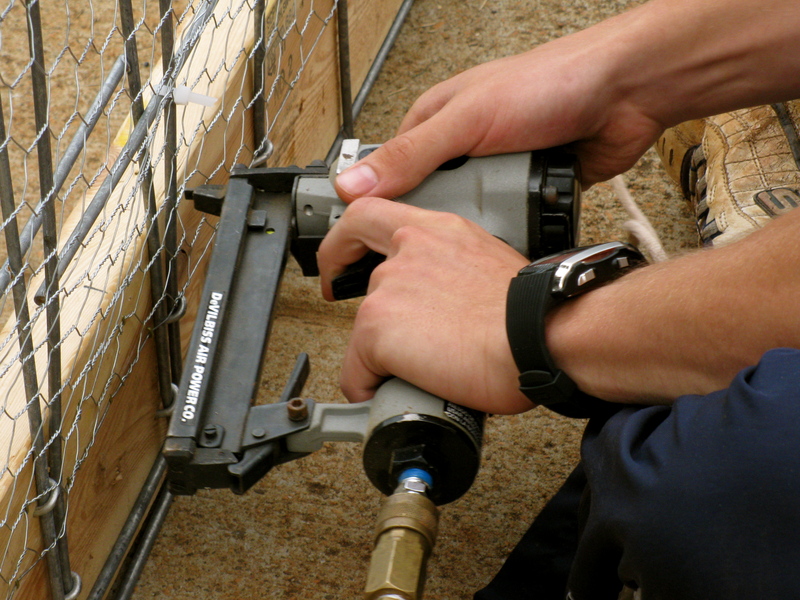 Once the fence was in place, we u-nailed it to the wood frame. Next. we cut the backs and fronts. 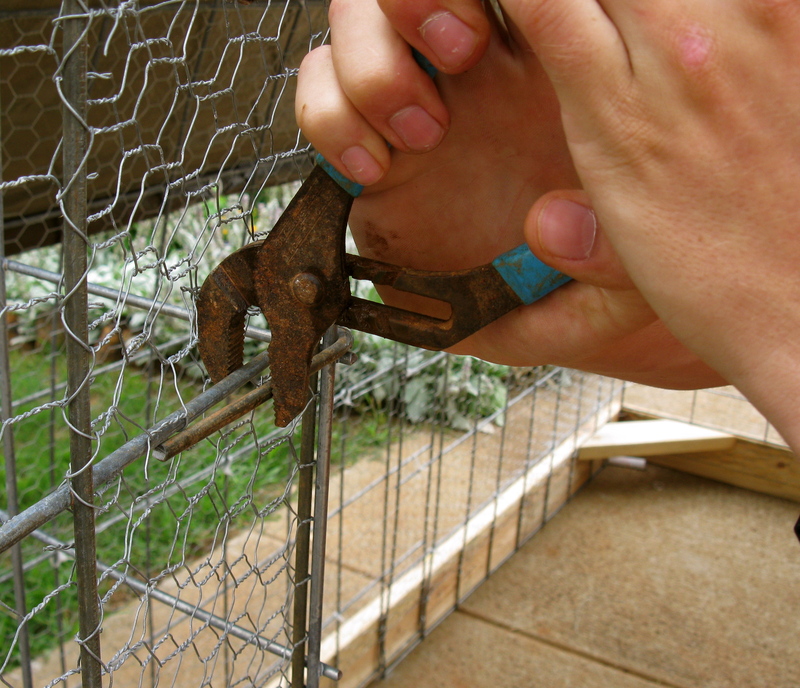 The holes on the cattle panel are too big for chickens so we attached chicken wire to the inside. Zip ties are a wonderful invention. 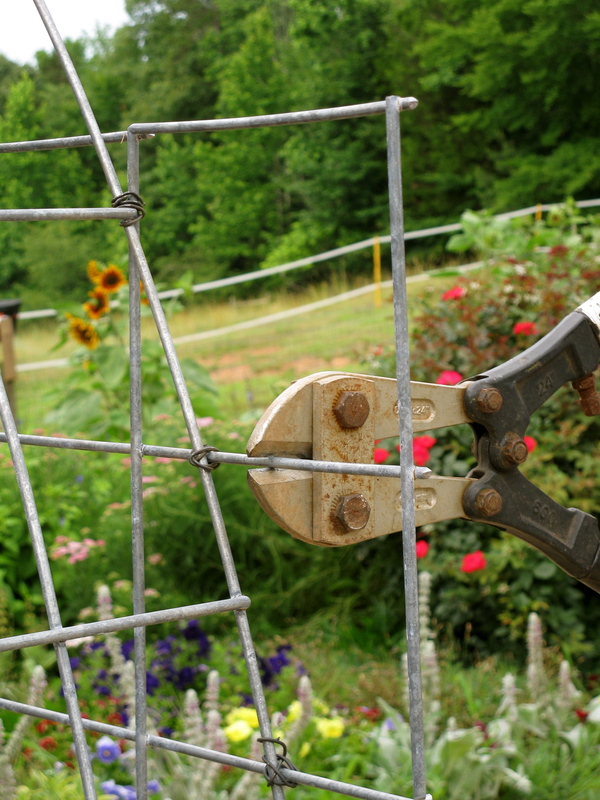 We used these and baling wire to attach the chicken wire. 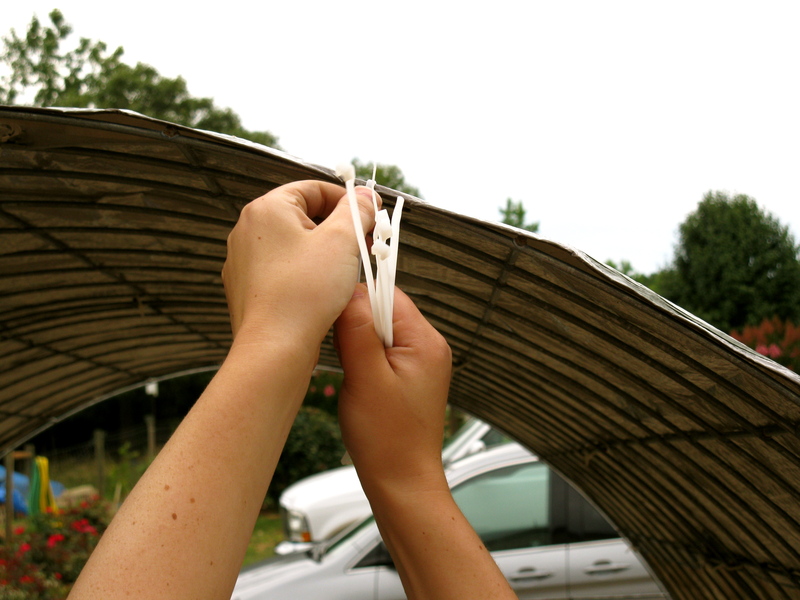 We also used the baling wire to attach all the panels together – corners and overhead. Michael stapled the bottom of the wire to the wooden frame. Putting baling wire on all the connecting points between the back panel and the side piece. Because of the tension from the cattle panel, I thought it would be important to reinforce the corners. I wanted a door I could walk through so I had Squish paint the top piece for the door frame. This piece would run across the entire front of the cage to add stability. The back and front pieces stuck out too far for me, so I had the corners cut off without interfering with the integrity of the panel’s strength. 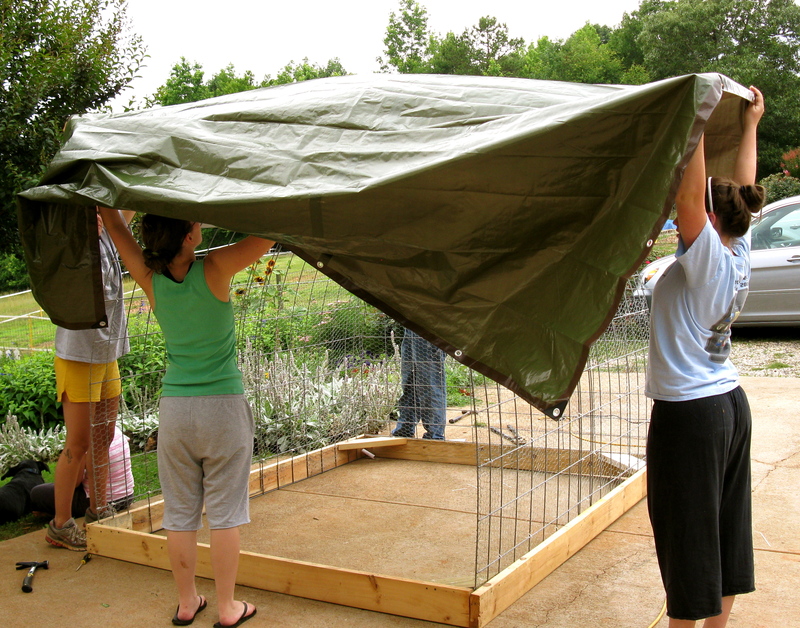 We had an 8’x6′ tarp and realized it was too small but we left it on and added the larger tarp. 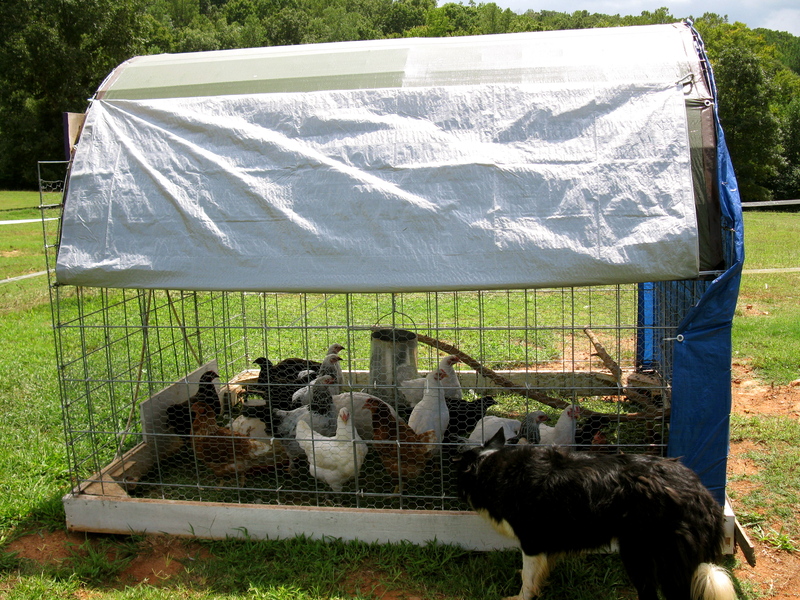 This tarp is 8′ x 10′ and fit perfectly – right to the top of the chicken wire on the inside. We zip tied the tarp to the frame. Michael is about 5′ 10″ and his head is still below the roof. after a bit of thinking and collaborating, we decided where to cut the opening. That purple board was wired to the top of this piece of panel and to the sides . 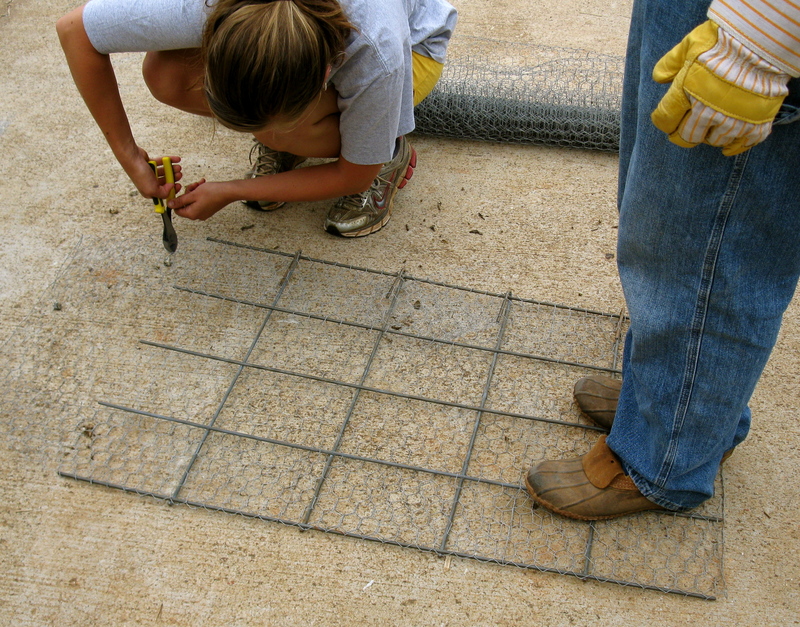 We cut a piece of panel and covered it with chicken wire. Thanks goodness for Michael and his strength. Folding back the wire on itself to make a hinge was the hardest part. The completed door! I reinforced the bottom of the door with another piece of wood to add strength and to fill a small gap. 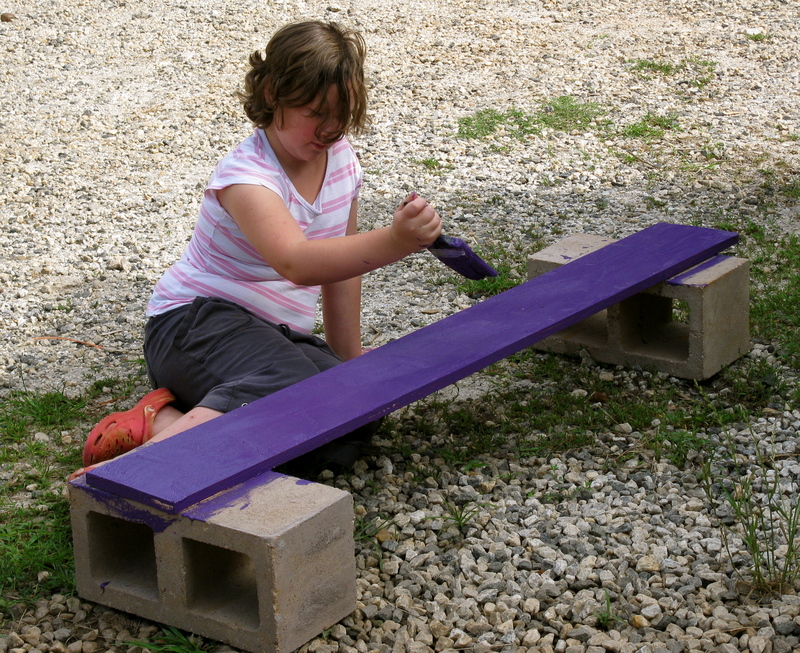 This wood was untreated – it’s what I had in the barn, so I painted it to help preserve the wood. and a canvas for some creative painting! I still need to add the wheels to the back corners to help with ease of movement. 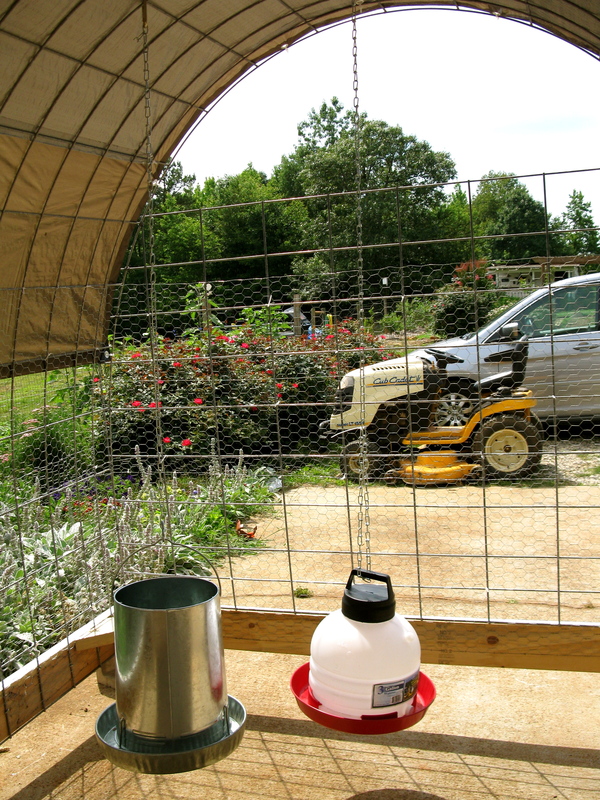 But until this tractor goes out to pasture, it can be used as a dog kennel…. or a playhouse for children! 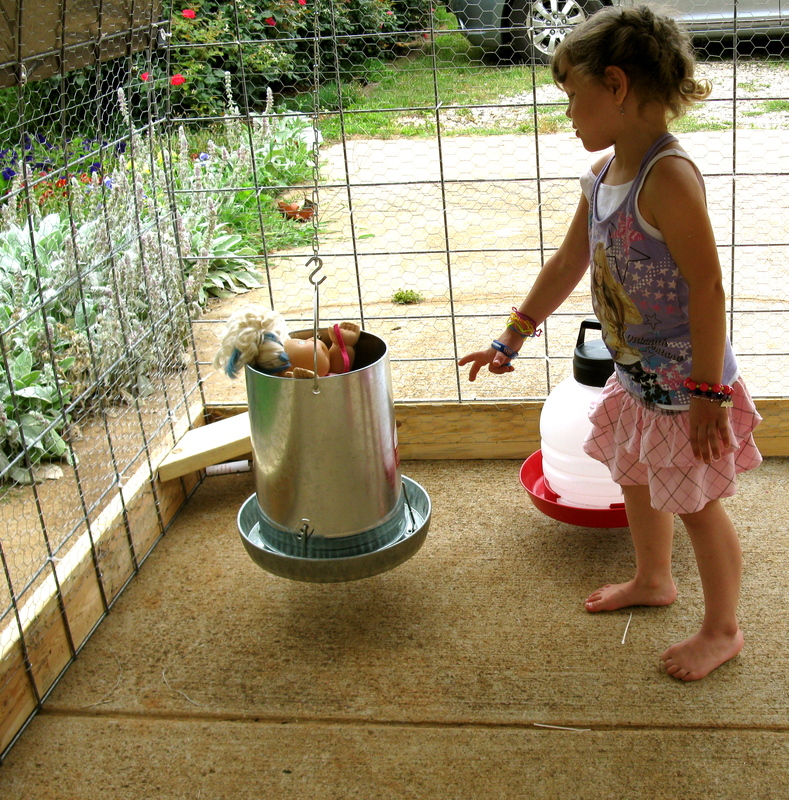 This little gal put her baby in the chicken feeder and called it a bucket swing. So there you go! Copy, modify, whatever. Isn’t that part of being neighborly? Sharing ideas and exchanging information? Have fun! I covered the back with a tarp and attached two on the sides. 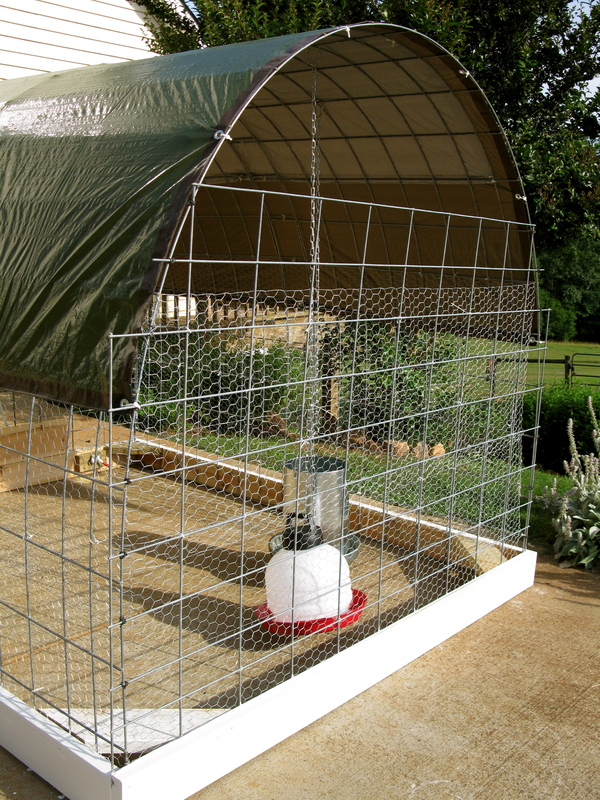 The ones on the side can be raised and hooked to allow more air flow and sunshine. 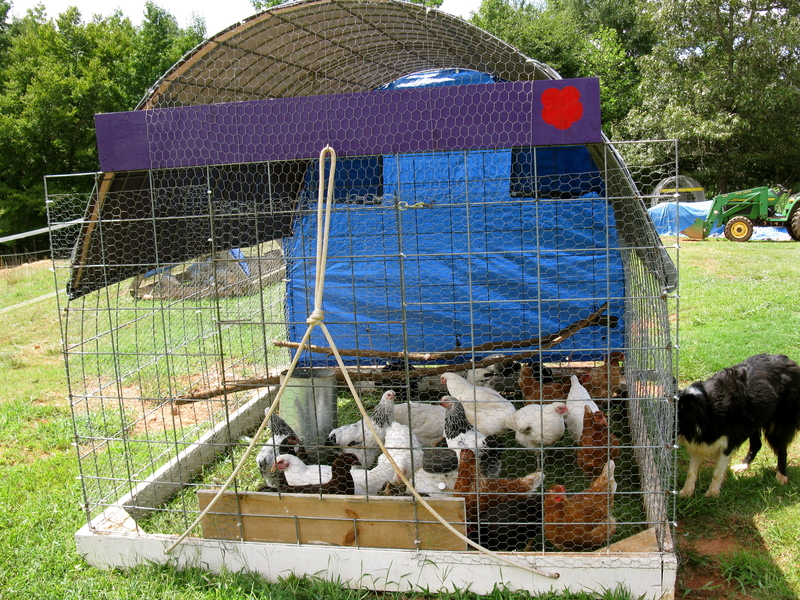 I also had to cover the top opening with chicken wire. A couple of the hens thought it was great to fly up to the purple board, sit and survey the grounds for luscious bugs, and then hop to the ground to eat them! love it! 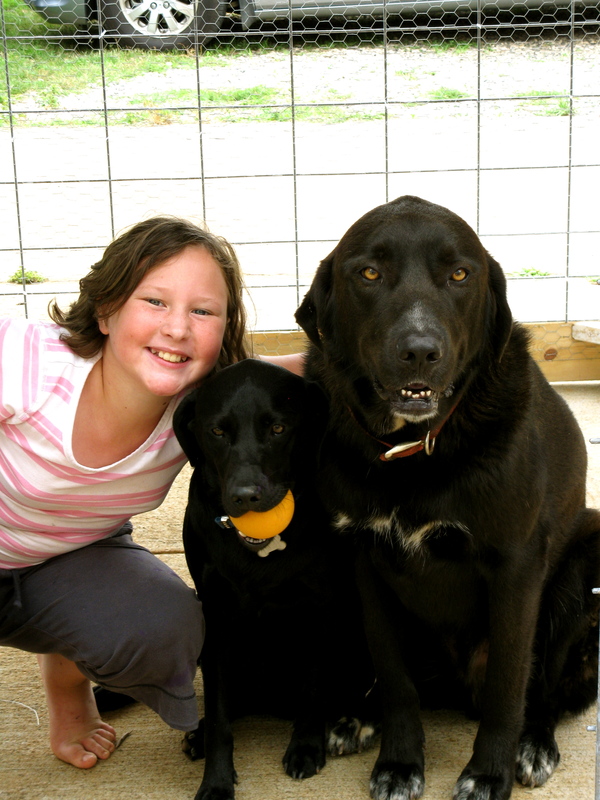 before we moved we were getting eggs from a farm that had something similar, but 10x’s as large. Brilliant idea, but I knew I could never copy it! 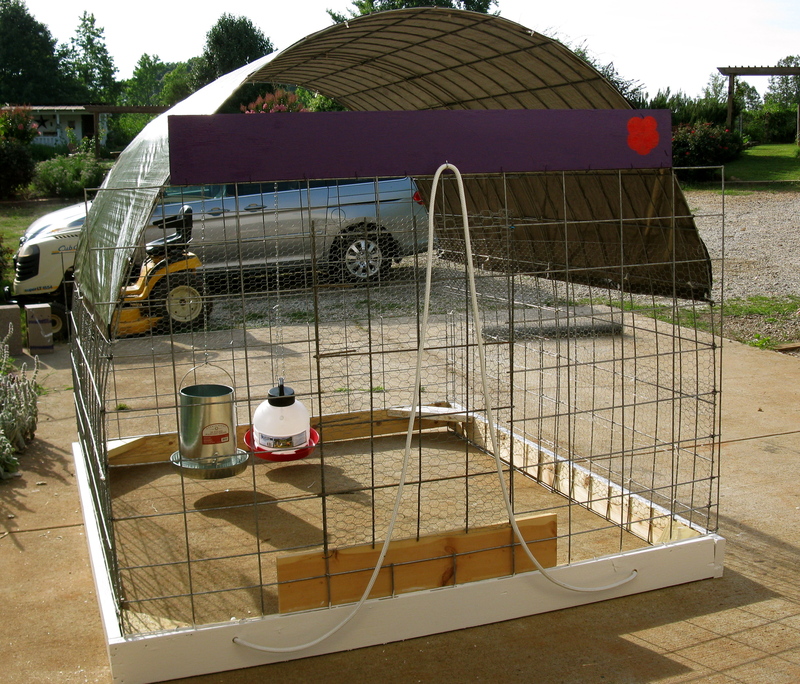 Maybe I’ll be able to create something like this for when we get chickens next year! =) Do you think it is pretty preditor safe? Could you pull it if needed, or is it way too heavy? Looks wonderful! 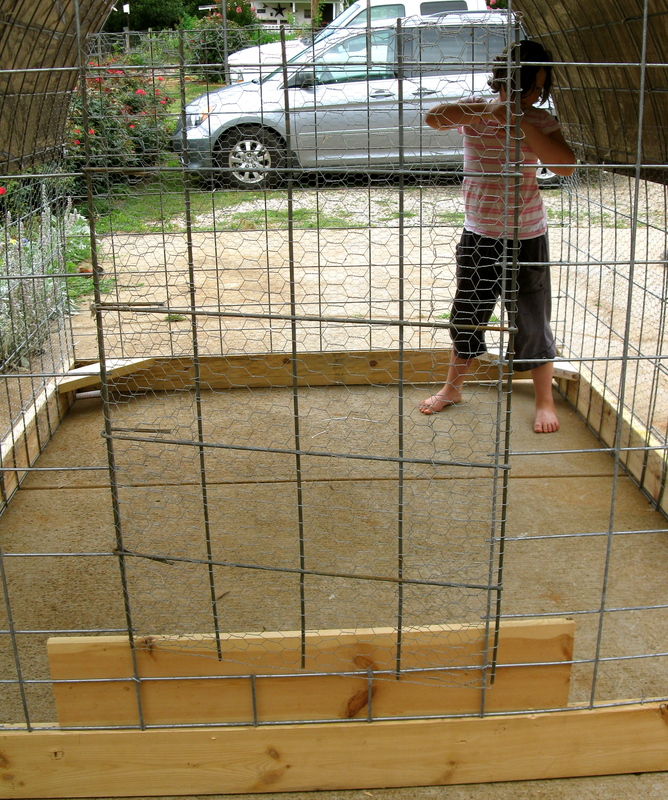 To make it predator proof you would want to use hardware cloth or rabbit cage wire. 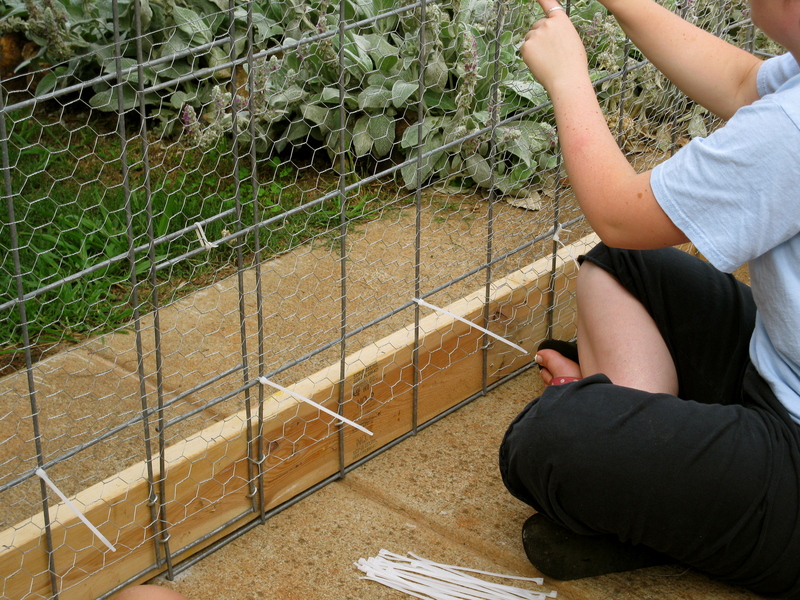 Chicken wire is nearly worthless and is only good for keeping chickens in. It won’t keep anything else out. I’m sorry this sounds so negative! 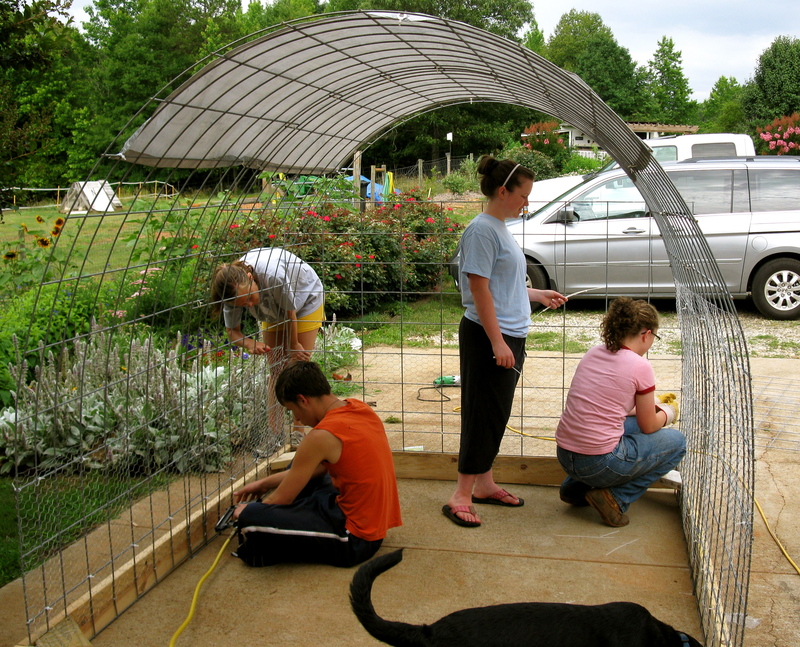 LOL However, I have learned to really hate chicken wire. It bends too easily, rusts quickly and is just generally a waste of time & money. We have a couple of hoop houses though and I Love them! 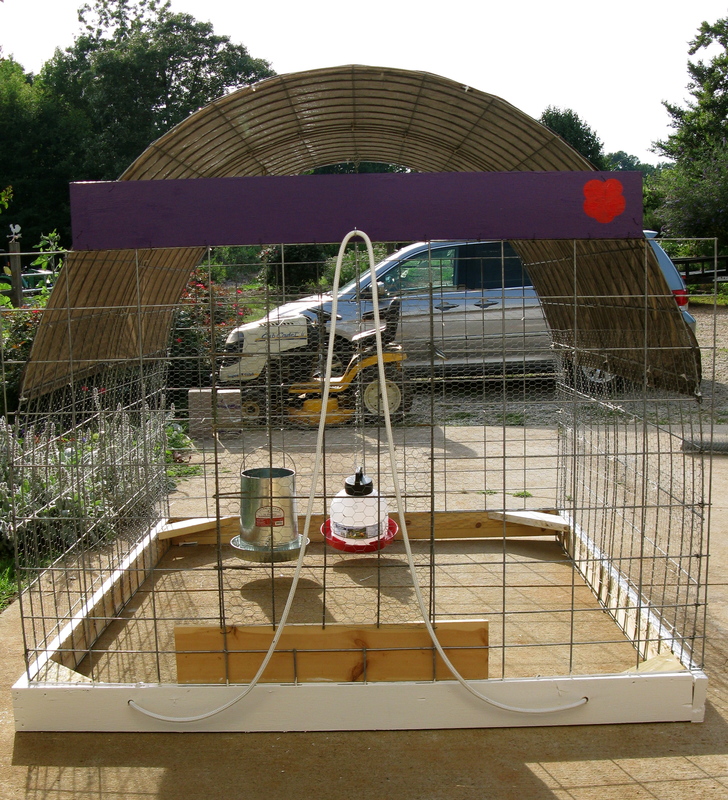 Wow you chicken tractor looks great! We built a quick one this week but it was not nearly that elaborate. I’d love to see this up close. I like this but what about a heavy rain? I’ve also put tarps on the sides that I hook up during the day. Also works to keep in heat when it gets cooler.